You know those clothes you’re wearing – the ones made with good old-fashioned needles and thread? Give it a few years and they just might be completely obsolete. The advent (and subsequent rise) of 3D printing has revolutionized many industries – allowing everything from rapid manufacturing to tissue reconstruction – but its usefulness is by no means limited to scientific or medical fields. Case in point: this year has already seen the release of many 3D-printed fashion items, custom-printed to exactly fit the people wearing them. Whether you’re a shoe aficionado or simply see shoes as, well, things that go on your feet, you can probably attest: it’s tough to find a good pair of shoes, especially if you’re balancing requirements for quality and comfort with style and price. 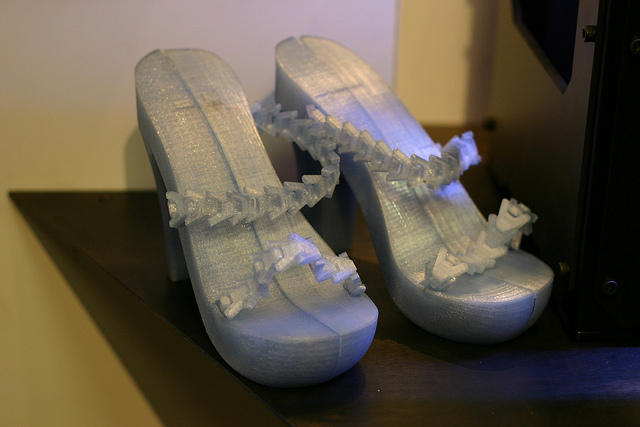 But with 3D printing, even the unconventional geometric shoes by Continuum or the Exoskeletonstyle by Janina Alleyne can be shaped to fit your feet for optimum comfort. Plus, the materials they’re made from provide strength and durability despite the delicate, detailed designs. This in turn allows for more experimental styles that can withstand day-to-day wear and tear more fully, like the skeleton-inspired Biomimicry shoes. Equally groundbreaking are the highly avant-garde yet easily assembled Rapidprototypeshoe (or should that be Rapidprototypeshoes?) by Marloes ten Bhömer – when you need to replace them, you can simply print out the parts and assemble them yourself. Being generally smaller and easier to print out, it’s no wonder that accessories like sunglasses and jewellery have been the subject of 3D-print experimentation. The JointedJewels set by Alissia Melka-Teichroew, for example, consists of jewellery made with detailed geometric forms, fitting together in a way that would purportedly be impossible to manufacture otherwise. These CellCycle rings are likewise intricate and futuristic, arguably a fitting look for jewellery made with the very latest technology. But not all 3D-printed items look vaguely alien; the 3D-printedsunglasses by London designer Ron Arad come in both modern and vintage styles. Or for an added personal touch, you could go for easily customisable and highly quirky Tapestry spectacles. Arguably, the biggest 3D printing-related stir in the fashion industry of late has been caused by Dita von Teese and the unique3D-printed gown (designed by Michael Schmidt and Francis Bitonti) she modelled earlier this year. Made of nylon and printed by Shapeways, it was assembled from 17 separate pieces that were dyed black, lacquered, and festooned with over 13, 000 Swarovski crystals. Designer Iris vanHerpen, similarly, is known for stunning works of fashion that combined 3D printing and hand-crafting skills to fascinating, evocative effect. It may be quite some time before 3D printing hits the high street, but imagine just how much things will change when it does. You’d be able to take designs to shops and have them print out custom-fit clothes for you; but equally, shops would be faced with having to prevent their designs from being illegally downloaded and printed at home. What are some of the advances you’re most excited to see in the fashion industry? Share your opinions in the comments.